George Graham Reviews Ollabelle's "Riverside Battle Songs"
In a way, we have come full circle in folk music. The 1950s and early 1960s brought a folk music boom, but in those days, it was considered something of a sacrilege to perform anything but traditional songs. Bob Dylan started out that way on his first album, but then shook everyone up by pouring out what appeared to be an endless stream of original songs that seemed to change everything. And before long the folk-singers became -- or were replaced by -- the singer-songwriters. It has been that way for close to 40 years. But in recent times, there has been considerable revival in interest in traditional songs again, particularly among singer-songwriters. Numerous albums have been released which include, or are exclusively devoted to traditional songs, by people as diverse as Bruce Springsteen, Natalie Merchant, and acclaimed Boston area songwriter Merrie Amsterburg. This week we have yet another turn of the wheel. It's the new recording by the band Ollabelle, called Riverside Battle Songs. 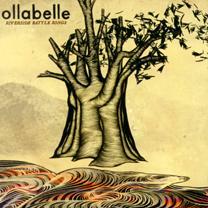 Ollabelle emerged in 2004 with an outstanding debut recording. The group consisted of a diverse bunch of individual performers who all were headquartered in New York, and lived or performed regularly in lower Manhattan near the World Trade Center. Following September 11, 2001, at a nearby folk club in the East Village called "9C," the performers who would form Ollabelle would gather to sing old spirituals for solace. Though they were maintaining their individual careers, they decided to make a recording, and it came to the attention of T-Bone Burnett, known for producing the soundtrack for O Brother Where Art thou? He had a production deal with a record label, and the first Ollabelle album was released in early 2004 to considerable acclaim. The members of the group drew mostly on the old spirituals but gave them their own distinctive spin, without altering them too fundamentally. Now, some two and a half years later, Ollabelle, reduced to a quintet from a sextet, is out with a follow-up. And where their debut recording was of primarily of traditional songs, their new CD is mostly original material, though one could easily be excused for thinking that they could be traditional songs. They have absorbed the sound of those old songs quite thoroughly, and create an album that is quite satisfying. It's both full of interesting and original musical touches, while keeping a sound that could easily have come from, say, the 1960s. When the band's first album emerged, the members were still maintaining their separate careers, and the success of their recording was perhaps a bit of a surprise for them, but they got on the road and toured extensively, sharing the bill with such diverse performers as Ryan Adams, Buddy Miller, as well as Alison Krauss and Union Station, and Ralph Stanley, and even jazz signer Diana Krall. Along the way they became more cohesive as a band and began writing together. Ollabelle's members have diverse backgrounds. Vocalist and mandola player Amy Helm comes from a musical background -- her father is Levon Helm, the drummer with the legendary group The Band. Guitarist and vocalist Fiona McBain is from Australia, drummer Tony Leone comes from a jazz background. Bassist Byron Isaacs performed with various groups as a sideman, as well as working toward a career as a songwriter. Keyboard man Glenn Patcha is a native of Canada but had worked extensively in New Orleans. To prepare for the new album, the group went north to Amy Helm's hometown of Woodstock, settled into a house and came up with about 30 songs, which sounds like something that Ms. Helm's father did a generation before with Bob Dylan. They enlisted the help of producer Larry Campbell, who in something that perhaps is not a coincidence, was a long-time member of Dylan's band. They whittled down the song list, and came up with this fairly generous 13-track CD. All the members contribute to the writing, but there are also three traditional songs, including one by the band's namesake Ola Belle Reed. The original songs continue the musical and lyrical direction of their first album, with words that sound as if they could be from old spirituals. There are a couple of love songs, though they have a kind of melancholy quality. Ms. McBain describes the CD as "a collection of song of hard times, loss, compassion and hope." On Riverside Battle Songs, the band is pretty much self-contained in this very understated production, though Campbell adds some additional instruments like pedal steel guitar, banjo and the like. While there are some electric guitars and organs, the texture of the CD is rather timeless. It sounds as if it could have come from any time since the mid-1960s. Ollabelle's new second album Riverside Battle Songs is as impressive as their first recording. They claim more coherence as a band, and it shows to some extent on the new CD, though I had no complaints about their debut. Their biggest change is the predominance of original material, but their new songs are very much in keeping with the traditional music they did first time around. The musicianship is first rate and the arrangement ideas, while including familiar instrumentation, show good deal of creativity. The collective structure of the band with no clear leader and everyone taking turns on lead vocals, is another distinctive touch. Sonically, we'll give the CD about a B-plus. After recording the album in New York, the band sent it to T-Bone Burnett to mix it in Los Angeles. Burnett has a tendency sometimes to go for an in-your-face compressed sound. The vocals on this occasionally have that quality, and instrumentally the sound is somewhat dark. Ollabelle's fine new album represents another turn of the cycle. From the days of singer-songwriters, Ollabelle was one of the artists and groups that emerged to revive traditional folksongs. Now, as happened more than a generation earlier, this group originally dedicated to doing traditional music is now turning mainly toward original music, and doing a very good job at it.